The Genesis Programme is recruiting a Development Officer to work on our First 3 Years Initiative. Please DO NOT submit CVs. In the ongoing implementation of the KiVa Anti-Bullying Programme, a new Parents’ Guide will be available to all parents through the participating schools over the coming weeks. In a handy A5 format this is a great resource for parents. 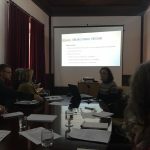 The Genesis Programme were involved in consultation events and workshops on the development of the Healthy Ireland for Louth Plan which was launched recently. We are pleased to see much of our work outlined in the plan and look forward to continuing to collaborate with partners in delivering outcomes for the children and families we work with. Congratulations to all involved in the development and publication in the series of documents launched at Louth County Council. 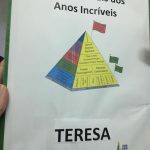 In January 2019, Claire Gleeson, Development Officer (North Louth) represented The Genesis Programme on the PINN project (Proactive International Network for Newborn and Young Children) learning exchange trip to Coimbra, Portugal. The Erasmus+ funded trip organised by the Prevention and Early Intervention Network (PEIN) was also attended by colleagues Hazel Murphy of YoungBallymun and Orla Tuohy of Lifestart Foundation/Tusla along with partner organisations from Portugal, Norway and the Netherlands. The three day event allowed participants the opportunity to share best practice and to visit prevention and early intervention sites. 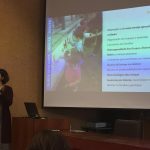 On the final day, Claire, Hazel and Orla presented on the work of their respective organisations to over 100 attendees at a conference organised by the University of Coimbra. 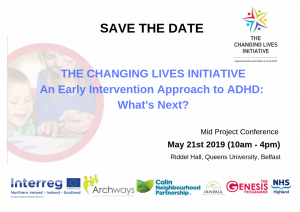 We look forward to the partner organisations visiting as part of the PINN project exchange to Ireland planned for 2020. The Genesis Programme held its first ever local Peer Coach training recently. The two day training is by invitation to accredited Dina Programme Group Leaders to become an Incredible Years® certified coach. An Incredible Years® Coach has demonstrated competency as a peer coach using the Incredible Years® coaching methods and processes to support new group leaders. This will significantly support the strategy to sustain programme delivery and fidelity in our early years services and schools. The training was provided by the excellent Peter Loft. Also completing the training was Tove Aasenhuus from Norway. helpformychild.ie – revised and refreshed! HELP FOR MY CHILD.ie is an Online Directory of Child and Family Support Services in Co. Louth. Originally developed by a sub-group of the Louth Children & Young People’s Services Committee, it has recently been fully reviewed and refreshed by The Genesis Programme. Twenty five early years educators and teachers from the Early Years Services and Primary Schools listed below have just completed a 3 day Incredible Years (IY) Classroom Dina Training tin Dundalk with senior IY trainer Peter Loft. The group are pictured with Peter. Well done to all and good luck with implementing the Classroom Dina Programme! At the launch of the KiVa Anti-Bullying Programme in November 2018, we took the opportunity to discuss the programme with some of the Principals whose schools are implementing the programme. Here are a selection of short videos where the Principals reply to questions about the implementation of the programme in their school. We are recruiting an Administrative Assistant! Closing date for applications is 5pm on Thursday 7th February 2019 and interviews are scheduled for Wednesday 27th February 2019. 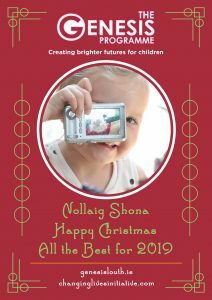 We would like to wish you a very Happy Christmas and Best Wishes for 2019. Nollaig Shona. The Genesis Programme offices will reopen on Wednesday 2nd January 2019.